Pennsylvania became a state December 12, 1787, the 2nd state admitted to the Union. Harrisburg was settled in 1718 when John Harris opened a trading post on the Susquehanna River. It became the capital in 1812. Many people say the present capitol is the finest in the nation. It was dedicated in 1906 and has a beautiful riverside park, museum, and Forum. Its style is called “Italian Renaissance” and it has 651 rooms and a 272-foot dome, imitating St Peter’s in Rome. 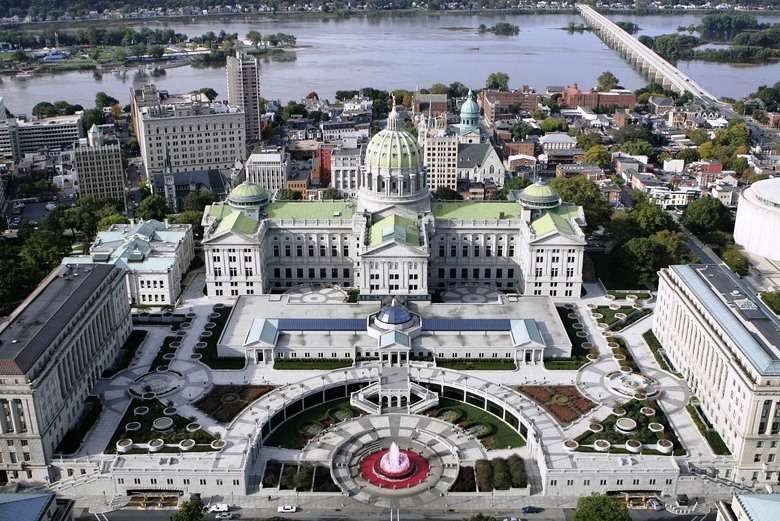 Harrisburg is in “Pennsylvania Dutch” country. There are many farms and big red barns around the area. Hershey — where all that candy is made — is a few miles away and has a “chocolate” amusement park. Gettysburg National Military Park is not far away. The overrich lushness of the capitol-building art; the big-town small-town feel with farm-surround; the working class; the river and the wooded atmosphere; Mr Hershey’s legacy just down the road, the sweetest person of philanthropy; chocolate and love. Mountains near: Appalachian Mountains. Mount Davis, in the southwest part of the state, is the highest point in Pennsylvania at 3,213 feet.